The Personal Injury Group Attorneys of Morris James LLP frequently handle claims of minor children who have been injured in automobile accidents. Minor children, by definition, are children under the age of eighteen. Unlike adults involved in personal injury actions, a minor by Statute must have a legal representative appointed on his or her behalf. A legal representative generally consists of a parent or other loved one that is willing to pursue the action on behalf of the minor and to make decisions with the minor’s best interests in mind. If an injury settlement is reached between the litigants, the settlement must be approved by Delaware’s Superior Court before the insurance company will issue the check. Court approval is required even if no actual lawsuit has been filed. The purpose of this rule is to protect the minor’s interests and to ensure that any settlement on behalf of the minor is in the minor’s best interest. Generally, Court approval is a two-step process. The first step involves the litigants formally petitioning Delaware’s Superior Court to authorize or approve the terms of the settlement. The Petition generally outlines the injury the minor sustained, the medical treatment received by the minor, and medical records and expert reports outlining the injury and expenses incurred. If the minor is fourteen years of age or older, the Petition also must include a sworn affidavit on behalf of the minor approving of the settlement. The second step required for Court approval of a minor’s settlement involves a hearing in open court on the merits. This hearing involves testimony by the minor and the minor’s legal representative regarding the accident, the nature and extent of the injuries suffered by the minor and highlights the supporting medical evidence. Approving the disbursement of funds for the payment of the expenses of prosecuting the tort claim and any unpaid obligations of the minor person associated with the tort claim. Appointment of a guardian of the settlement property of the minor to be derived from the settlement. Once the Order has been entered into and the terms have been met, the Superior Court will then transfer jurisdiction of the matter to the Court of Chancery to oversee the guardianship. The settlement proceeds are then only accessible by the minor on his or her 18th birthday unless earlier withdrawals upon formal petition are permitted by the Court of Chancery. The Chancellors will not permit withdrawals for ordinary living expenses and will only consider petitions for emergency or extraordinary expenses. The Personal Injury Group Attorneys of Morris James LLP suggest that you protect your minor loved ones by seeking counsel that is familiar with minor’s petitions to ensure your loved ones are protected. 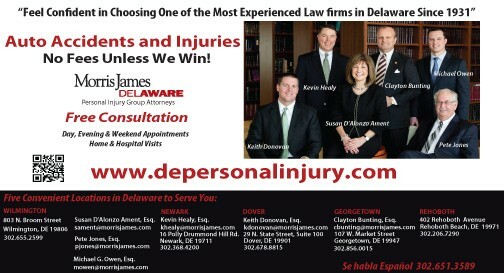 The Personal Injury Group Attorneys of Morris James LLP combined have 153 years of experience in personal injury litigation and stay current on all of Delaware’s legislation affecting individuals involved in automobile accidents. If you or a loved one suffers the unfortunate event of an automobile accident, the Personal Injury Group Attorneys at Morris James LLP will guide you through the process of obtaining maximum compensation for your injuries to which you are entitled under the law.